Hotel Sangeet is situated in the heart of Shimla city, the capital of the mountain state Himachal Pradesh. The hotel offers remarkable sights of lush green valleys and mountains. Hotel Sangeet is situated in the heart of the city Shimla near mall road. The main bus stand is at a distance of 1 Km from the hotel and 1.3 Km from railway station. The hotel overlooks the scenic view of lush green valleys and Himalayan mountain ranges. Hotel Sangeet has 20 well furnished rooms with all modern facilities. The rooms are spacious and elegantly decorated for a comfortable stay. Each and every room of hotel is the reflection of well-designed interiors. The rooms of hotel overview the panoramic sights of green valleys and snow covered mountains. Well cleaned washrooms are attached with all the rooms where hot and cold water is running round the clock. Hotel Sangeet has a multi cuisine restaurant that serves delicious Indian, Chinese, Tandoori and Mughlai delicacies. Room service is also available for the convenience of guests. Sunrise Travels Shimla team visited hotel Sangeet personally and found that all rooms are well maintained that gives a comfortable stay. The hotel is best in cleanliness. Well trained staff and good hospitality worth the value you pay for. Actual photographs taken by our Travel team are displayed above on the right side of the page. 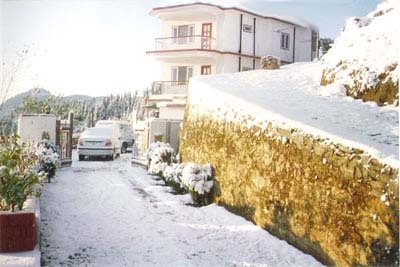 Contact us to get the best price for this hotel and Himachal travel packages.